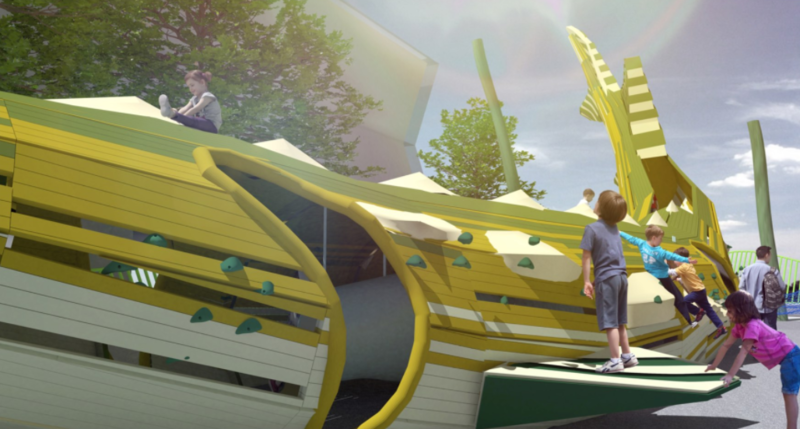 OLIN and the Hudson River Park Trust have revealed updated designs for Pier 26 in Tribeca. 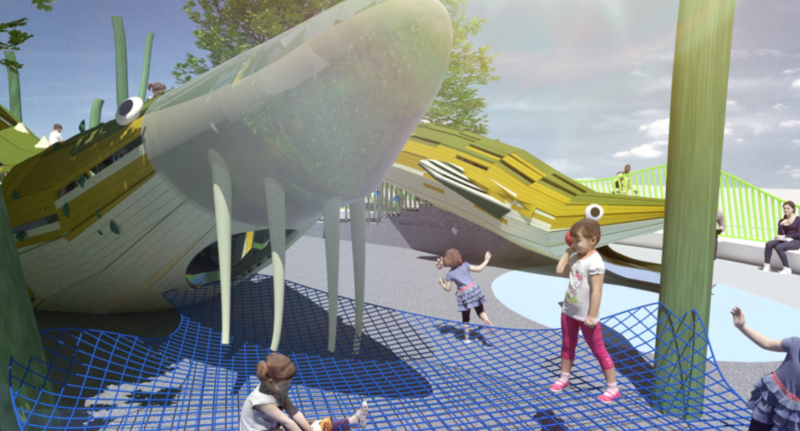 The waterside space, part of Hudson River Park, will now feature a playground with two large, very scalable fish. 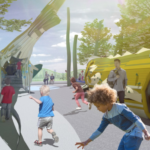 The Philadelphia firm initially presented a comprehensive plan for the pier to Manhattan Community Board 1 last December. 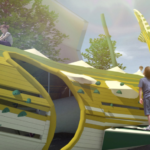 The latest design meeting in September, however, focused on the nautical playground, which sits near the pier on the mainland. 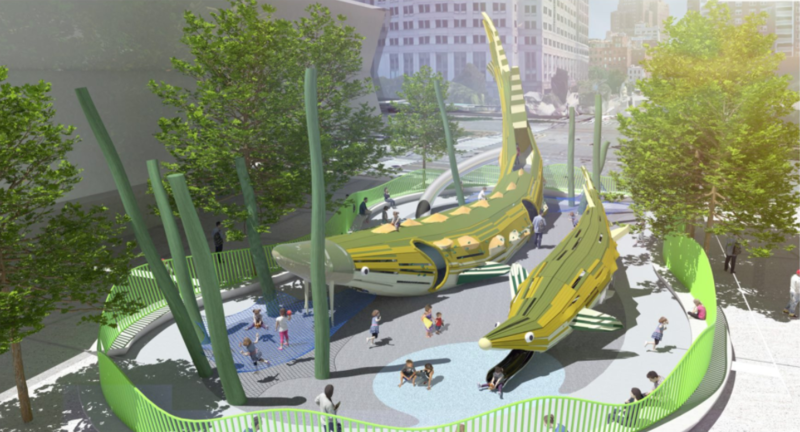 While the December plans featured a“nest pod” playscape, the new playground’s centerpiece is an Atlantic sturgeon and a shortnose sturgeon, supersize green metal versions of endangered Hudson River species that children can climb on, dart inside of, and slide through. 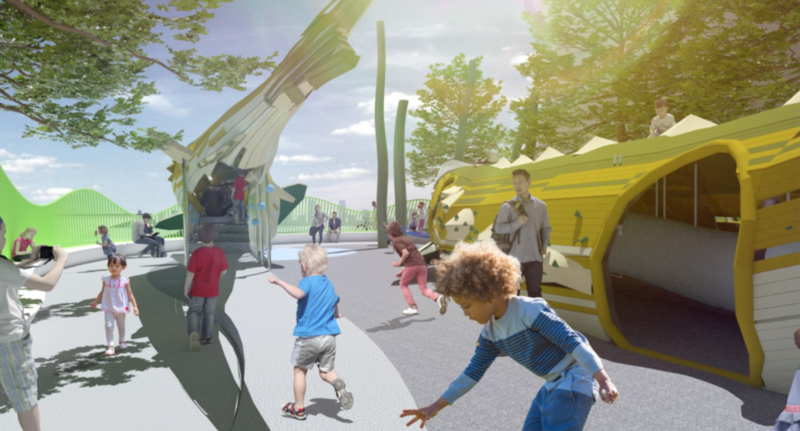 The design is in keeping with the Trust’s mission to steward the Hudson River estuary and provide low-cost or free educational and cultural programming to residents. Right now, plans feature sports fields, an overwater net for lounging, and other recreation spaces atop the 80,000-square-foot pier, which sits on Manhattan’s far west side between Hubert and North Moore streets. 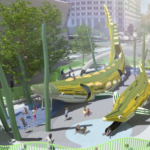 The sturgeon playground is sited just to the south of City Vineyard and the Downtown Boathouse, Pier 26’s commercial occupants. 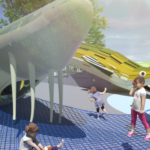 Development of the pier has been a long time coming: In October 2015, the Trust brought on Raphael Viñoly to design an estuarium, and eventually, the group would like to build a river study center to complement the park’s recreational programming. The Tribeca Trib reports that the Trust is still seeking money for the Viñoly project, while the river center is currently neither fully designed or funded.